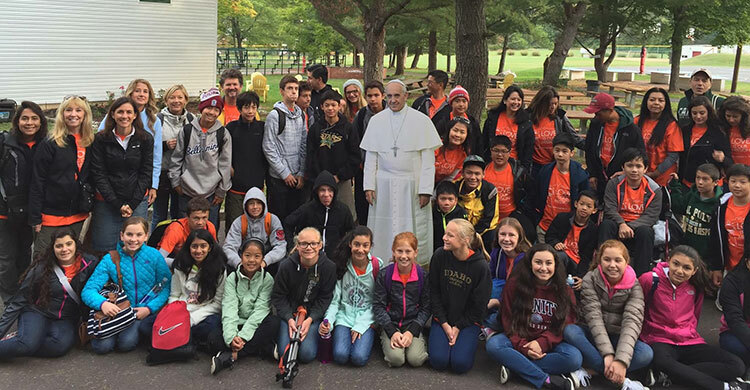 Fifty-nine students, faculty, parents and religious from Canyon Heights Academy spent 5 days in Philadelphia, including seeing the Pope Francis in the parade, listening to his address on the balance between politics, religion and culture at Independence Hall and watching the concluding Mass at the World Meeting of Families. The group traveled each day into Philadelphia and battled the large crowds surrounding all events with the Pope. They waited 7 hours on the streets for a glimpse of the Pope on Saturday as he went by in the parade. For many, this was the highlight of the trip. Even though it required a massive amount of patience, nothing could beat the thrill and exhilaration of seeing the Pope pass by, even if it was brief. In addition, the group visited a number of sites in the area including Valley Forge, Independence Hall, the Constitution Museum and the Liberty Bell. When the group went to visit these historical sights, many of the students were able to relate what they had learned in previous years to the pieces and places of history before them. Before returning, the group made a quick trip into New York City to see the Statue of Liberty and visit the 9/11 Memorial, where they also enjoyed a slice of delicious New York pizza on the side. Fr. Timothy Lyons, Chaplain for Canyon Heights, organized the trip. As soon as he heard about the Pope visiting the US this fall, he began making plans. Normally the 8th grade class makes a field trip to Yosemite, and this trip required much more planning.